The O’Keefe Rail Trail’s extension is progressing, through Axedale, the Campaspe River Reserve, the new McIvor Highway trail ‘tunnel’ (underpass), over a new Campaspe River trail bridge, and is now heading off in an easterly direction towards Knowsley as contractors progressively build the trail’s next sections. What else is also being built along the trail? The Axedale Our Town Our Future community group, together with the Friends of the Bendigo-Kilmore Rail Trail group, have been busy purchasing and installing outdoor table-seat units in this beautiful river environment of the Campaspe River Reserve. A total of three ‘double’ table-seat units and two bench seats were installed on the western side of the river in late Dec 2013. Then three sets of bike racks were installed in Mar 2014. With the financial support of Fosterville Gold Mine-Crocodile Gold Corp’s 2013 community grant to the Friends of the Bendigo-Kilmore Rail Trail (FBKRT), one outdoor ‘single’ table-seat unit was able to be purchased. 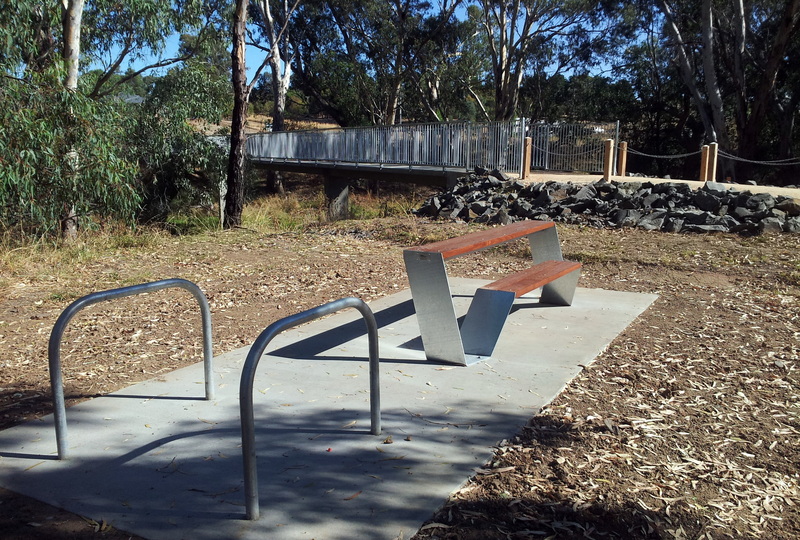 The Strathfieldsaye and District Community Enterprise is also very supportive of the O’Keefe Rail Trail, and through a 2014 community grant awarded to the FBKRT, this funding enabled the purchase of an additional table-seat unit. Both Fosterville Gold Mine-Crocodile Gold Corp, and Strathfieldsaye and District Community Enterprise, are to be thanked for their support and interest, in assisting the local community as well as attracting tourists to the area. 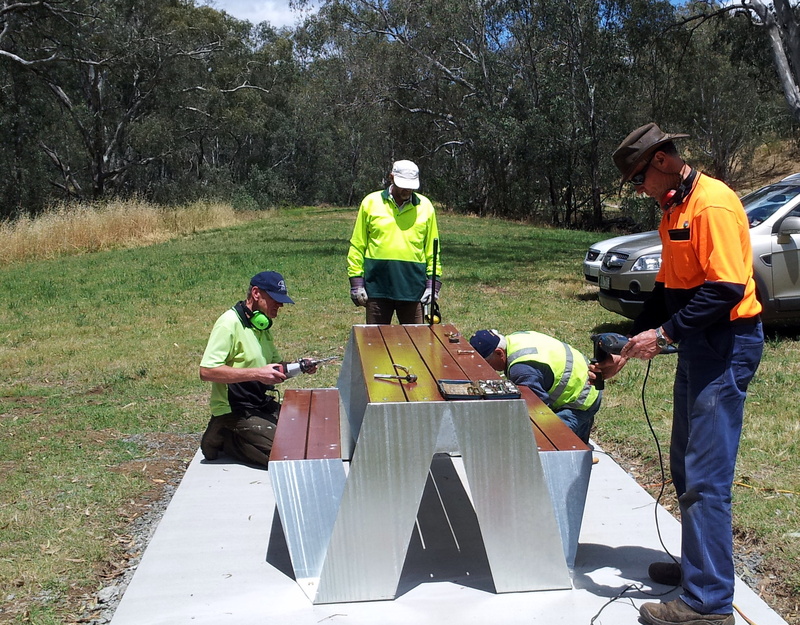 Added assistance from the City of Greater Bendigo Council’s O’Keefe Rail Trail Project, enabled these two table-seat units and bike racks to be installed by Friends of the Bendigo-Kilmore Rail Trail volunteer members. With these new facilities now located in this natural river environment, they are proving to be quite an attraction for rail trail users, fishing enthusiasts, picnicing families, as well as local Axedale residents. What a great place to rest, then restart from, when on your local morning or evening walking exercise around Axedale!